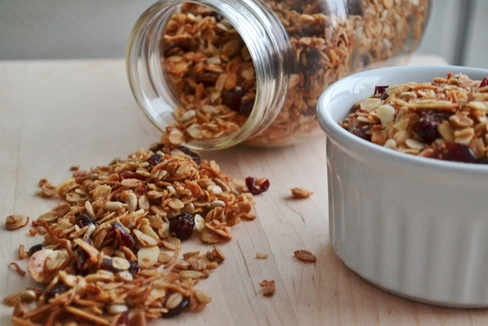 OK, so lately I have been absolutely obsessed with making granola. I decided to start making my own since “crunch” is Aria’s go-to breakfast (mainly because it is also her dad’s favorite and he is up with her in the am), and so many store bought brands are loaded with unnecessary sugar. I love granola that looks like granola (yes, you can see the oats and big pieces of nuts or dried fruit), and I’m not into spending $8.99 a bag for it (hello NYC). So, I’ve been obsessed with mixing and matching ingredients and finding the perfect combo. Here’s what I’ve found out about mixing the perfect blend. OATS: All granola has a base of oats. Most recipes will tell you to use old fashioned oats not the quick oats. I’ve tried all and actually found my best success with Trader Joe’s Organic Oats and also the surprising inexpensive organic oats from Mrs. Greens (in the bulk self serve bins). Quick oats will bind a bit better, but I like the texture of the real deal. CRUNCH: So, my biggest hurdle in the first few blends was getting a little crunch out of it. In researching online I found a few secrets including switching to a quick oat, and also adding some oat flour to get it all to bind. I used ground flax instead of oat flour and this also seemed to work. Also, I read about adding a little applesauce to the mix to get some more clumps which turn into crunchy oat clusters. However the biggest secret is adding an EGG white to the recipe. SCORE! SWEETNESS: It doesn’t take a lot to bring in a little sweetness. The popular sweeteners include maple syrup, honey, brown sugar and vanilla extract. I usually half whatever the recipe is calling for (0r nothing at all). I’ve found using a mixure of honey and brown sugar yields a best result, but also skipping it all and adding in some dried fruits works for us just fine! COATING: You’ll need an oil or melted butter to coat the oats. I usually use coconut oil, but have also used a mild tasting safflower or olive oil. I stopped measuring and usually use enough to coat my batches. You may not need as much as some recipes call for, but it is important that there’s enough to coat and bind. ADD IN’s: The best part!! Adding in coconut and dried fruit also kicks up the sweetness factor. I love these hence I cut down on the other sweeteners. Also, nuts and other add-in’s can add flavor and nutrition. My last batch I added some sprouted quinoa to the oat mixture before popping it in the oven (so good). I also am big into adding chia seed (packed with power) and flax seed which both give added flavor, texture and nutrition. THE BAKING: I suggest baking a bit lower temp than the recipe suggests. Also, use a good cookie sheet. My first batch burned at the 350 temp on my not-so-great sheet. I’ve done the last few at around 250, and actually have had great success baking them in the toaster oven (on the small sheet that comes with it). My perfect recipe to come! Spring is in full bloom and everything is flourishing around us. I sit at our lake house staring out at what are now full canopies of green leaves, when just weeks ago there were just little buds springing out on bare branches. Nature is an amazing and beautiful thing, constantly renewing itself and allowing the seasons to take their course. I taught this past weekend at Mayfest (see post below) on Finding Our Flow (both on and off the mat.) So, how do we do that? It’s an ever-progressing task and, even though teaching on the subject, I must admit, often I am not in flow. It’s always a work in progress, and indeed I believe we all come in and out of flow. But, when we are in that space, doesn’t it feel so good? When all seems aligned and we are in the place of effortlessness and fluidity. When we feel like all within and around us is just moving in the right direction, or we are just “in the zone” and operating at our best. I did a bit of reading on the subject of how creatives “get in the flow,” and much of the research comes back to a Professor of Psychology, Dr. Csikszentmihalyi, who asks the question “What makes a life worth living?” He concludes that pleasure and satisfaction in lasting activities that bring about “flow” (versus the material or superficial) are the only answer. From yogis to composers to star athletes, we all seem to want to be in that flow space. Even just as human beings– as moms and dads, entrepreneurs or just regular ol’ folk making our way– we all desire to be in a state of ease, having the feeling that we are at our peak, effortlessly creating and exactly where we are meant to be. So, how do we get into flow? Easier said than done, right? When is the last time you felt content or, moreover, in flow? Do the Work: Well, as mentioned, Flow is a work in progress– the key word being work. We have to make efforts to get to that space, no matter what we are doing. And, as Dr. Csikszentmihalyi points out, we have just the right balance of challenge (in activity) and skill to take on that challenge. So, we need to find our achievable challenge, and work at it. On the mat that translates to knowing our asana (poses and alignments), and being able to execute them without letting anything else, especially our minds, get in our way. If we’re too busy thinking about our foot placement, or where our hands are supposed to go, or what the pose looks like, we cant get into flow. We need to know the poses and alignments, so that we can stop thinking about them, and just do them. Proper alignment also (literally) opens us up, allowing energy to flow easily (along our meridians) within. Off the mat we also have to do the work that’s required to get to our desired place. Life is full of challenge, but when we can align ourselves and our lives with our ultimate goals we can move toward happiness and flow. But first we have to figure out where we want to go. What are our passions? What brings us happiness? We need to know this before we can move in that direction. Then we also need to do the work. How do we make the changes in our life that are necessary to get to that place? What do we need to eliminate? What do we need to work harder at to bring change? We often get comfortable or lazy in life, not wanting to reach toward the ultimate, and instead settling for a life the is “good enough.” Good enough doesn’t bring flow, or the ultimate bliss that comes along with it. Be Present: Csikszentmihalyi’s work has identified that one of the factors of flow is “intense and focused concentration” on the present moment. Makes sense, since we can’t be fully in something if our mind, intention or body is not fully involved. On the mat this is often challenging, no matter what our experience level. As new yogis, we often get uncomfortable in the poses, feeling awkward and challenged, often yearning to get out. Even experienced yogis battle with fully being in each pose, perhaps jumping ahead of whatever the pose by predicting the sequence, or simply getting uncomfortable and looking forward to next movement. No matter what our level, often all the chatter in our mind and our “inner critic” further prevents us from being fully present. We are instead thinking about how we didn’t do that last movement right, or how we don’t look as good as the person on the mat next to us. But all of this only hinders us, and our flow. We need to just BE where WE are, not worrying about anyone else, or even about what we did up until that point, silencing our inner critic and just being present. Be in the pose of the moment. Breathe in it, and be there. Off the mat it’s also often a challenge to stay present. We often get caught up thinking about what has already happened, or what’s to come in our lives. We repeat the past in our mind, letting it literally hold us back, instead of just letting it go. Or we are constantly thinking about (or worrying about) the future– what we still need, or all the things we don’t yet have. These are extremely limiting, and will block flow completely. When we are IN the moment, completely immersed in the present, we can’t be longing for anything of past or future. If we can just be where we are, trusting it’s exactly where we need to be, then are we able to experience the fullness of it, and move with ease through it. 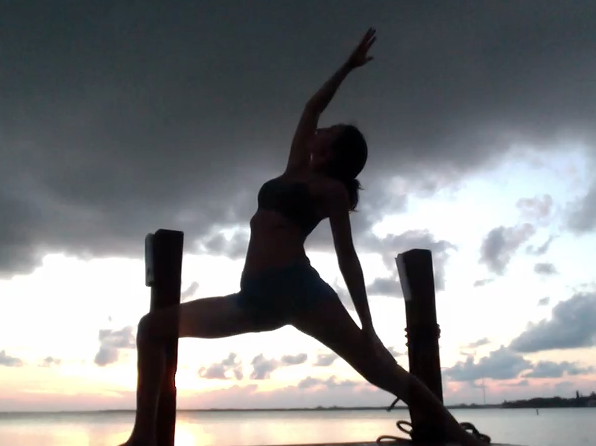 Just Breathe : Here comes the yoga teacher in me, bringing it all back to breath. I believe that both on and off the mat, a simple way to move toward flow begins with breathing. Focusing on the easy, steady, rhythmic, balance of breath can allow us to move toward a state of calm, ease and flow. Our inhales open us up, literally letting gravity (or the universe) fill us, and create more space within us. Our exhales allow us to release and let go, only to be filled again. It’s this steady, even cycle that allows us to tune in, and be in tune. Just like the trees and so much of nature, we can effortlessly move through different seasons. When we set our intentions, do the work/meet the challenges and remain present, we move toward flow. I believe the real yoga happens when we can drop out of our heads and into our hearts. When we can can operate from this space, letting our hearts lead, we can navigate with a little more ease– both on and off the mat. So, perhaps today we all breathe a little deeper, open up a little more and move with a little more steadiness and grace. Ultimately, we can find our flow. This Weekend: MAYfest– Music, Art & Yoga for the whole family. So, this weekend I’ll be teaching at Mayfest, the Hudson Valley’s first Music, Art & Yoga Festival. I’ll be teaching a Vinyasa class on Saturday at 11am called Finding Your Flow, for all of you out there who want to find your flow (both on and off the mat). I’m excited to be a part of such fun weekend event, and to be teaching alongside some renowned teachers like Sadie Nardini and Justin Wolfer. The weekend will basically be like going back to camp (for all ages). The lineup includes great bands, stellar yoga classes, nature hikes, paddle board yoga, a wellness village and so much more– all in a beautiful lakeside location that is just over an hour from NYC. The best part is it’s totally a family affair. Bring the kids along because Mayfest is also offering a “Kids Canteen” with plenty of offerings for the little ones including story time, yoga, sports, and even nature writing. Plus (best, best part), childcare is available so that mom and dad can totally take advantage of all the adult fun stuff going on. For more information or to get tickets go to www.MAYfestNY.com. Hope to see you there! Over the last few weeks, I’ve been chatting about the idea of renewal and expansion with my yoga classes. How we can expand in our practice– maybe breathe a little deeper, reach a little higher, give a little more– and also (as always with yoga) how we can take that off the mat and put it into practice in our lives. Sometimes we get narrow– especially when we get uncomfortable or face something difficult. We get anxious, and our mind seems to only focus in on the problem in front of us. Whether that’s in life, or while encountering discomfort in a particular pose, we let that situation overtake us, and can’t seem to see anything beyond that. But what if we could expand beyond the discomfort in these moments? What if we could see whatever that encounter is as trivial or temporary, and look past it, not letting it take us over? Perspective is such a huge part of being happy. Think about it. What are you focusing on today? Believe me, there are plenty of days I have to remind myself to not get caught up in the negative. Inevitably the “what ifs” and “should have beens” creep into my own mind as well, and I have to (as Taylor Swift so aptly sings) shake em off. Just last night I lay in bed thinking about what could be different, how I might be happier, and about the things my life is missing. Sometimes we just can’t help but go there, but how detrimental this is!! Thank God it’s a conscious choice to let it go, and go beyond this type of thinking. This morning, I looked around me and was reminded of how incredibly blessed I am am. How full and abundant my life is, regardless of it’s imperfection, and how much I have to be thankful for. No, life is not perfect. It never will be. And we can always find things to want, things that are missing or things could simply be better. But focusing on all that we do have can flip a switch in us– literally turn darkness into light. Seeing (and focusing on) the abundance that IS there, will only bring happiness and, in turn, more abundance. A common psychology tool for those who are depressed, is to have them to look up, above the buildings or trees, and into the sky and above the horizon– to see beyond what’s right in front of their feet, or in they’re immediate line of vision. Sometimes when life is hard, we need to remember this. Even when it’s not, how much sweeter is life when we look upward and realize how much possibility exists beyond what we can see? So today, I hope we can all be more expansive. Reach a little higher, breathe a little deeper and turn our faces to the sky and feel the warmth of the sun. Today, look above the building tops or out into the horizon, and realize how much goodness and possibility exists, and how many more good things are to come.